Gaddafi Spoof Video Excites Libyans Until...They Find An Israeli Produced It! A young Israeli man, Noy Alooshe, saw Muammar Gaddafi's televised speech when all manner of things looked strange: his clothing, his arm movements and his speech about how he planned to hunt down anti-government protesters. The result is this video spoof, which Libyans are loving, and most probably don't know an an Israeli created it. Alooshe use the music of rapper Pitbull, "Hey Baby," and software to sync the dictator's movements to the music. The Zenga Zenga title is a further spoof on Gaddafi's use of the word "zanqa" which means "alleyway." In a matter of a few days, the video had close to 500,000 hits. Mr. Alooshe, who at first did not identify himself on the clip as an Israeli, started receiving enthusiastic messages from all around the Arab world. Web surfers soon discovered that he was a Jewish Israeli from his Facebook profile — Mr. Alooshe plays in a band called Hovevey Zion, or the Lovers of Zion — and some of the accolades turned to curses. A few also found the video distasteful. At the site of the YouTube video, I saw a comment that said "Israel stands with the People of Libya - Long Live Freedom, Long Live Peace." Alooshe, 31, said it was exciting to "be making waves in the Arab world." He even had some supporters among the Egyptian anti-government forces. Read the entire story here. Watch Gaddafi's speech here. Visit Noy's website, Hovevey Zion (his band) here. How About a Newt Gingrich - Allen West Ticket for November 2012? Newt Gingrich is such a loose cannon. He says three things I love and then completely decimates conservatism with the fourth. At a Palm Beach County fundraiser, Gingrich said if he wins the Republican nomination for president he will "strongly consider" a Floridian as his running mate. He specifically mentioned new Republican Congressman Allen West, an American hero by every measure and a true conservative, which Gingrich is not. I would come close to voting for whomever puts West on the ticket for Vice President, because I believe he will hold that person's feet to fire. The other bonus is, I would have the opportunity to vote for West for president in 2020. How I would love to see West as a VP candidate! Read about West and the Council on American-Islamic Relations (CAIR) here. Watch West's CPAC 2011 video here. Allen West on The Patriot Act. Watch an incredible speech by West on Empowering Your Spirit. Read about West's amazing military career, and how he did the most he could to protect the men and women serving under him. "It's basically over for Anglos" in Texas. It's a terrible situation that you are in. I am worried," says Demographer, Steve Murdock said. B y 2040, only 20 percent of the state's public school enrollment will be Anglo, he said. Last year, non-Hispanic white children made up 33.3 percent of the state's 4.8 million public school enrollment. The state's future looks bleak assuming the current trend line does not change because education and income levels for Hispanics lag considerably behind Anglos, he said. Unless the trend line changes, 30 percent of the state's labor force will not have even a high school diploma by 2040, he said. And the average household income will be about $6,500 lower than it was in 2000. That figure is not inflation adjusted so it will be worse than what it sounds. As yet, no similar stats to be found for Arizona, New Mexico and California. Read the story at Texas Politics. What will it take for them to believe their own investigations? When a Tustin, Cal. man was indicted on immigration charges and accused of lying about his contact with a relative who worked for Osama bin Laden, the Council on American-Islamic Relations (CAIR) blasted the case for its reliance on an informant it considered unreliable. In interviews with Southern California Public Radio in February 2009, CAIR-Los Angeles Executive Director Hussam Ayloush said the FBI has been "hiring shady characters," and "a convicted felon, a con artist" who should not be believed. Now, that same convicted felon is the foundation for a class-action lawsuit CAIR filed with the ACLU this week against the FBI. The Bureau, it alleges, sent informant Craig Monteilh into southern California mosques to conduct surveillance on people simply because they are Muslims. The lawsuit represents three men active at the Islamic Center of Irvine and the Orange County Islamic Foundation, but seeks class action status on behalf of hundreds, perhaps thousands, of people who interacted with Monteilh. It also requests a court order requiring the government destroy all the information he gathered. This action comes one month after CAIR officials claimed their organization had a "consistent policy of positive and constructive engagement with law enforcement officials." That defense was required after CAIR's San Francisco chapter posted a flier on its website, urging people to "Build a Wall of Resistance" by not talking with the FBI. FBI officials have not commented on the lawsuit. The allegation that agents are sending informants into mosques without cause has been made for several years. FBI Director Robert Mueller has repeatedly denied this charge in public and under oath before congressional panels, saying "we do not focus on institutions. We focus on individuals. And I will say generally if there is evidence or information as to an individual or individuals undertaking illegal activities in religious institutions with appropriate high-level approval, we would undertake investigative activities, regardless of the religion." Andrew Arena, special agent in charge of the Detroit FBI office, made it clear during a forum at the University of Michigan-Dearborn last year that informants are a tool used to target a variety of crimes. "We use [informants] in gang cases, we use them in public corruption cases, we use them in everything we do," he said. "We use them in counterterrorism cases ... Folks, we don't target religions. We don't target buildings. We can't do it. Under our rules, under the laws of this land, under the Constitution we can't do it. I would go to jail; agents would lose their jobs." "Agent [Kevin] Armstrong once told Monteilh that while warrants were needed to conduct most surveillance for criminal investigations, 'National security is different. Kevin is God.' Agent Armstrong also told Monteilh more than once that they did not always need warrants, and that even if they could not use the information in court because they did not have a warrant, it was still useful to have the information. He said that they could attribute the information to a confidential source if they needed to." Unless Monteilh was recording his FBI handlers, it is his word against theirs. The lawsuit makes no reference to recordings that prove the allegations. There are recordings that may show Monteilh's work did target people warranting scrutiny. Though the case later was dropped, charges were brought against a man whose brother-in-law served as a bodyguard to Osama bin Laden and was designated by the United States as a terrorist. Ahmadullah Niazi was accused of failing to disclose that relationship and of lying about his travels to Pakistan. During a February 2009 bond hearing, an FBI agent testified that Niazi referred to bin Laden as "an angel" and provided an informant – who turned out to be Monteilh – with taped sermons from an imam considered to have been a spiritual advisor for two September 11th hijackers. Agent Thomas Ropel, III, who is not named as a defendant in the CAIR/ACLU lawsuit, testified that Niazi initiated conversations in which he "discussed conducting terrorist attacks and blowing up buildings." In Detroit, a complaint charged Imam Luqman Abdullah with using his mosque to preach violent jihad and for weapons and martial arts training. Abdullah refused to surrender to FBI agents who came to arrest him, firing three shots before being killed by return fire. CAIR spent more than a year trying to blame the FBI for Abdullah's death, but separate reviews by the state of Michigan and the Justice Department's Civil Rights Division found the agents had acted appropriately. In Tampa, three members of the Palestinian Islamic Jihad's governing board served as religious and administrative leaders of a mosque during the early 1990s. One, Ramadan Shallah, serves as the terrorist group's leader today. The disappearance of young Somali men from Minneapolis believed to have joined the al-Shabaab terrorist group in Somalia was aided by meetings inside a local mosque. Homeland Security records obtained by the Investigative Project on Terrorism under the Freedom of Information Act show that a prominent Virginia mosque was "associated with Islamic extremists" and "operating as a front for Hamas operatives in U.S." A report by Immigration and Customs Enforcement dated in December, 2007, said the mosque "has been linked to numerous individuals linked to terrorism financing" and "has also been associated with encouraging fraudulent marriages." Any CAIR criticism of the FBI should be viewed in light of the Bureau's 2008 decision to cut off non-criminal communication with the group. That move is based on evidence the FBI discovered during a terror financing investigation which found that CAIR's founders were part of a Muslim Brotherhood-created Hamas-support network in America. CAIR itself is listed among the network's entities. Last year, a Department of Justice official succinctly reported that no new evidence had emerged "that exonerates CAIR from the allegations that it provides financial support to designated terrorist organizations." The outcome for the lawsuit against the FBI will take time. The record of the accusers, however, is already clear. The Investigative Project on Terrorism (IPT) is a non-profit research group founded by Steven Emerson in 1995. It is recognized as the world's most comprehensive data center on radical Islamic terrorist groups. For more than a decade, the IPT has investigated the operations, funding, activities and front groups of Islamic terrorist and extremist groups in the United States and around the world. It has become a principal source of critical evidence to a wide variety of government offices and law enforcement agencies, as well as the U.S. Congress and numerous public policy forums. Research carried out by the IPT team has formed the basis for thousands of articles and television specials on the subject of radical Islamic involvement in terrorism, and has even led to successful government action against terrorists and financiers based in the United States. 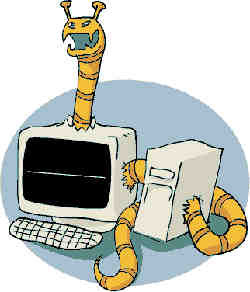 It's Cute, It's Cuddly, It Likes To Attack Iranian Computers! In a major setback to Iran's nuclear program, technicians will have to unload fuel from the country's first atomic power plant because of an unspecified safety concern, a senior government official said. The unloading of fuel rods only a few months of loading is NOT a routine occurance at any Nuclear Power Plant in the world. It is a sign of a problem either within the plant, with the fuel rods, or both. I doubt that the Iranians will be able to bring the plant back on-line any time soon. Whatever was paid for the Stuxnet worm was money very well spent. It has out performed expectation and is still going strong. WHEN ARE AMERICANS GOING TO SEE MOSLUMS ARE ON A CRUSADE (CALIPHATE) TO CONQUER AMERICA??? is no more, and religion is for is for Allah. From sharia4america: US moslums taught/told to NOT OBEY US LAW! Just How Does America Fight the Threat of Islam? This truly is an excellent article at Family Security Matters that gets to the heart of how to best battle the threat of Islam upon America. It not only points out how seemingly impossible it is to denounce Islam in America by anyone, it digs into how Islam can be revealed to all Americans - once you really KNOW your enemy, you can defeat them. Muslims, under the banner of religion, are infringing blatantly on the rights of others, not only in Islamic countries, but also in much of the non-Muslim world. By their acts of dogmatic barbarity, Muslims are slowly awakening the non-Muslim democracies to the imminent threat of Islamic terrorism keen on destroying their free secular and free societies. As more and more Muslims arrive in American land, as they reproduce with great fecundity, as they convert the disenchanted and minorities, and as petrodollar-flush Muslims and Muslim treasuries supply generous funds, Muslims gather more power to undermine a serious challenge to the American system of governance—democracy. As for democracy, the rule of the people, Muslims have no use at all. And another key aspect to defeating Islam is to understand that this made up aspect of a "radical" Islam is just that - made up. The minute you believe that there is a radical element to Islam, that is the minute you are agreeing that the rest of it is "normal." Therefore there is no such thing as “radical Islam.” And those who take a “liberal” view of Islam should be forced to back up their nouveau interpretation with unabrogated scriptural facts. Unless such “reformists” can denounce fascist Islam with scripture, they are the true radicals, which is why we never see them pointing to scriptural arguments against jihad...they cannot because they are lying. Islamic terrorists are only doing exactly what Muhammad demanded, and his demands were not suggestions and they were not ephemeral. They were “perfect,” eternal ultimata. Let us not forget that the terrorists are faithful and true to what is written in their holy book. The best defense for America against Islam is simply education - we have seen the tremendous strides that the "islamophobia" gang has had in this country in furthering that "hate speech" scenario. Until we understand just WHY these advocates of Islam are spouting that word, islamophobia, we will be defenseless against it. And finally, it's not like we in America haven't had a set of previews to the effects of embracing this fake religion - the litany of documented destructive advancements in Asia, Europe and Africa are there for all to see, but we have to reveal it all in stark terms and not dance around it. My fellow Americans, America is faced with a formidable enemy. This enemy has a name: Islam. I think it is time to revisit the First Amendment of the U.S. Constitution and see if Islam is qualified as a religion. Is this an outlandishly absurd proposal? Not at all, serious problems require equally serious solutions. The call for evaluation of the First Amendment may be seen as an attempt to curb Islam or other militant cults. The truth is: it is. It is truly a matter of survival of the United States and the free world. It is time to take a stand and shift the debate to orthodox Islam. We do not have to investigate every other religion on earth in order to compare them or offer opinion about their relative “goodness” in order to declare that on the whole Islam perpetuates evil. Let others devolve into religious disagreements. But for those commentators who would respond: “OK great, so now what...you claim Islam is evil. How do we combat that?” Your response is already clear: Through the spread of truth, not deceit. Through voluntary social sanctions and laws in every civilized country that forbid evil practices like Sharia, coercion and violence against women, threats against those who disagree, honor killings, apostasy and other hate crimes. Let the world know the truth and decide for itself. Let Muslims who come to their senses opt out. America, with a long history of protecting religious freedom, still clings to the “hands off” practice of leaving alone any doctrine or practice billed as religion. A thorny problem is in deciding what constitutes a religion and who is to make that call. The dictionary supplies a sociologically useless definition for religion: “The expression of man’s belief in and reverence for a superhuman power recognized as the creator and governor of the universe.” Just about anyone or any group under this definition can start a religion, and they indeed do—and some do so at significant costs to others. As more and more Muslims arrive in American land, as they reproduce with great fecundity, as they convert the disenchanted and minorities, and as petrodollar-flush Muslims and Muslim treasuries supply generous funds, Muslims gather more power to undermine a serious challenge to the American system of governance—democracy. As for democracy, the rule of the people, Muslims have no use at all. 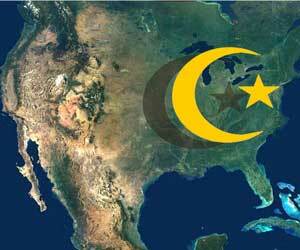 Muslims believe that Allah’s rule must govern the world in the form of Caliphate—a theocracy. Making mockery of democracy, subverting its working, and ignoring its provisions is a Muslim’s way of falsifying what he already believes to be a sinful and false system of governance invented by the infidels. Quran 5:50 "Do they then seek the legislation of (the Days of) Ignorance? And who is better in legislating than Allah for a people who have Faith." Quran 5:45 "And whoever rules not by what Allah has revealed, those are the wrongdoers." Quran 12:40 "The rule is only for Allah." Quran 18:26 "And He (Allah) allows none to share in his rule." A consortium composed of pandering liberal politicians, blinded by short-term self-interest and egotism, attention and fund-seeking self-proclaimed prima donna professors; and, bastions of useful idiots, are the witting or unwitting promoters of Ummah-ism. Unlike some peaceful religions such as Baha’i, Buddhism, Hinduism , Zoroastrianism and Christianity which advocate universally understood principles of good within their Holy books, and perhaps other religious doctrines (with which I am not personally familiar), Islam cannot be reformed. An example, when the Christian Catholic church was reformed, it was the church that was found to be in violation of Biblical teachings. It had in many ways become anti-Christian. Reform restored orthodoxy to the plain and well-understood concepts revealed by Christ and the disciples (one of the reasons it took so long was the church forbade lay-people from reading the bible or translating it from the dead language Latin...so Europeans were largely ignorant except for what they were told...see the story of Martin Luther). Some evolutionary ideas such as abolition of slavery were not addressed in the Bible (in part because Christ was after the souls not the bodies), but the other teachings such as compassion, forgiveness, non-violence, and brotherly love are and were always incompatible with slavery. Therefore it should be no surprise that eventually Christians in Europe and America led the abolitionist movement (they were scripturally correct). If a Christian bombs an abortion clinic, there is no scriptural commandment supporting this. It is unchristian (however, it is not unchristian to denounce abortion and seek to make it illegal and thus prevent abortionists from practicing their craft). It is sad when the counter-argument to this definition of Christianity is lame references to Old Testament violence. Old Testament stories are taught in Christianity as historical fact, not prescriptions based on Christian ethics. If to a Christian, God is sanctioned a violent act, it is 100% irrelevant to the New Covenant that is taught by Jesus. So to say...yeah but the Bible has violence in it too is insultingly banal and misleading. If some Christians abused their doctrine and hid behind the Cross to justify their personal desire to kill, enslave, and conquer, then they are and always were sinners and they are wrong; and this is why Christianity has taken the natural form it has today...as a religion of peace and compassion (even if many supposed Christians continue to sin). This is not to say that Christians are unable to defend themselves, or intervene to stop injustice. Christians are taught to hate the sin and love the sinner...period! The decision to become aggressive is always a burden on the Christian conscience. The notion that only those who denounce what is plainly Islamic (and just as plainly repulsive) are therefore the tools of Jews, or right-wing, paranoid, NASCAR-loving, gun-rights-worshipping, evangelical Christians must be exhaustively combated and rejected. This politicizing and obscuring reality only keeps people confused, inured, and numb. But because both those who believe Islam is defective and those who believe it has been hijacked are equally in opposition to terrorism and coercion, there is confusion about how Islam should be regarded. Perhaps the contrasting viewpoints should be named so they can be referred to as valid concepts. The notion that Islam is peaceful, but that only “radicals” are usurping and distorting the “peace-of-Islam” should be called: Islam-revisionism and advocates called Islam-Revisionists. The notion that Islam is inherently violent, coercive, harsh, Jihad-oriented...and that it advocates slavery, intolerance, and inequality...and that such traditional and realistic interpretations cannot be reformed should be called Islam-realism and such advocates called Islam-realists. Once the side of realists has a name and can distinguish itself from wishful revisionists, the public can begin to see that there are many voices which (without advocating a specific competing religion) can denounce Islam per se, and can speak to the real reasons. Islam continues its onslaught, and can counter any senseless position, such as reforming them and bringing democracy and tolerance to their lands (the RINOS position). What do our elected official say about Islam? Recall how many times former President George W. Bush praised Islam? Recall President George Bush’s love affairs with the Shaikh Abdullah of Saudi Arabia and President Obama’s bow to the Saudis’ Shaikh? Apparently, both presidents were/are unaware of the existence of Maj. Nidal Malik Hasans in the United States military, though the entire 8 years of the presidency of George W. Bush consumed around the 9/11 tragedy and Islamic terrorism. Next in line to the Islamic Republic of Iran, Saudi Arabia is the largest sponsor and supporter of Islamic terrorism in the world. Go figure! Please tell the American people what has been done since this Muslim-American Maj. savagely killed 14 people while shouting Allah-o-Akbar (one unborn child) and hurting 30 others? As I noted, the recent dastardly mass murder at Fort Hood, committed by Maj. Nidal Malik Hasan will be forgotten by the public before very long. Life will continue on its deadly course, pushed along in a variety of ways by agents of death, Islamists. Only the families who lost their loved-ones and those who survived the bullets have to live the rest of their lives with incapacitating injuries and, in the main, won’t be able to put the episode behind them. Those who claim that they want to reform Islam want to transform it by stripping it of a great many provisions that are anathema to civilized humanity. These people are, in fact, trying to make a new religion out of the old with no divine authority that was, supposedly, bestowed upon Muhammad to launch his religion. If I am right, then Islam will always be a bête noire to the West. Even dopey secularists and leftists will realize that fact one day, perhaps only after their delusions sink all of us. But realizing the fact that this religious power is at eternal war with you is not an act of hopelessness, and therefore it is not a call to pollyanishness. 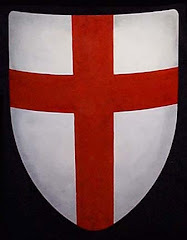 It simply means we must always be on our guard and never self-deluded. It may mean we have to leave the Islamists alone and hope that their people slowly convert to another religion or become unaffiliated. Until then, we should keep our powder dry. There is no such a thing as radical Islam! I have refused to accept several organizations that seek to combat or expose the antics of “radical” or “extreme” Islam, because I know that it is not extremism that is causing the violence...it’s mainstream, typical, normal, traditional, specified, canonical Islam. There are those who with a wink and a nod understand this but continue to work as revisionists because they are afraid of starting a religious war, even as they feel compelled to do something. They tell me, “You can’t openly accuse an entire religion of being evil! That would just incite them and make them hate us even more." My response: the war started in the 7th century, and if in the 21st century we still refuse to accept that reality, then there is perhaps no hope at all for civilization. Nothing good can come from deception. I argue that any belief system that licenses murder in the name of Jihad and the conquering and subduing of the world of the infidels by the Ummah, should be outlawed. Prophet Mohammad brewed up a militant, radical and extremely irrational imperialistic cult that sought world dominance. My fellow travelers, let us make one thing clear; Islam is no more a religion deserving our respect or legal recognition than is cannibalism. What can the American people do? It is time for the Americans to call upon the lawmakers of the United States of America to immediately create a safety board and commissioner to study and examine the dangers of Islamic dogma in our society. In the monumental task of dealing with Islam, every individual, group and government must combine their resources and energies to prevail. The destiny of the civilized life hangs in the balance. Shirking responsibility is an unpardonable act of every enlightened human being and organization that values human liberty and dignity. Video: So You Want To Take Some Pots Shots At U.S. Troops? Video: So You Want To Go Into a Shoppe In Paris? Think Again. 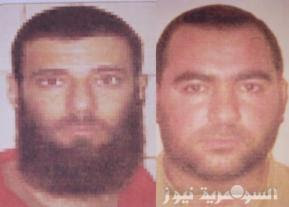 Abu Bakr al Baghdadi al Husseini al Qurshi, the emir or leader of al Qaeda's Islamic State of Iraq (right).and Din Allah Abu Suleiman, the Islamic State of Iraq's war minister (left). Photos from Al Sumaria. Put major emphasis on the words "not confirmed" in the following report from The Long War Journal but let's move forward that this is real - I don't think the Iraqi Army is nearly as inept at reporting as the Pakistani Army is. Iraqi security forces claimed to have killed al Qaeda in Iraq's "war minister" during a raid in western Iraq. The report has not been confirmed. Nasser al Din Allah Abu Suleiman, the Islamic State of Iraq's war minister, was killed by Iraqi Interior Ministry forces during an operation in the cit of Hit in Anbar province. "Based on intelligence, Iraqi security forces carried out the raid that killed him. US forces were not involved in this operation," Major General Qassim al Moussawi, the top spokesman for Iraq's Interior Minister, told Reuters. Suleiman has directed al Qaeda's suicide attacks against security forces, government officials, and civilians throughout Iraq. In the latest attack, al Qaeda killed 13 people in yesterday's suicide bombing in Anbar's capital of Ramadi. Now, I'm assuming this all went down in Ramadi after the major bombing there that is mentioned above and that's also why this report has to be taken with a grain of salt - the Iraqis may want to make the claim to instill some calm in a jittery public after this latest bombing. But let's hope this jihadi is dead and gone. It really would be good for everyone. US military and intelligence officials contacted by The Long War Journal could not confirm Suleiman's death but said they were aware of the reports. Iraqi officials identified Suleiman as Neaman Salman Mansour al Zaidi after security forces captured the so-called "interior minister" for the Islamic State of Iraq in late 2010. Suleiman was appointed by al Qaeda in May 2010 to serve as the terror group's top military commander after his predecessor, Abu Ayyub al Masri, was killed in a raid by Iraqi and US forces in April 2010. Video: I Just Can't Put My Finger On It But There's SOMETHING Different About Mullah Omar Nowadays . . .
A couple of articles from The Most Shelled City In The World. 1 million Israelis are asking: "Who's next?" Last night, Wednesday the 23rd of March, was the first time since Operation Cast Lead that an Iranian Grad missile exploded in Be'er Sheba, 40km from Gaza. Arriving at the scene of the rocket strike Thursday morning, in the Northern neighborhoods of Be'er Sheba, brought me back to the terror scenes in Sderot of the past few years. For several years, rocket attacks were part of my daily routine living and working at the Sderot Media Center. When the Tzeva Adom (Code Red) sounded, I would go to the neighborhoods where the rocket exploded and film the scene. The next day, I would return, documenting the 'the day after, listening to the stories of residents on what occurred to them the day before. 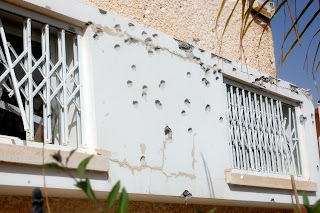 In Be'er Sheba, I saw the same scenes I'd witnessed in Sderot: shattered car windshields; the shrapnel holes making "windows" on the homes; the radius of damage from where the missile exploded; the 'cover up' of the missile hole; like nothing happened and expecting the people to go back to normal; the holes in the iron doors; the Shabbat candles standing among shattered glasses; pictures of Rabbis hanging untouched on what remained of the walls; frightened and excited residents of the damaged or destroyed homes who just want to share their personal experience with the world; hearing story, counting the amount of times I heard the words; Luck, coincidence, and miracles. 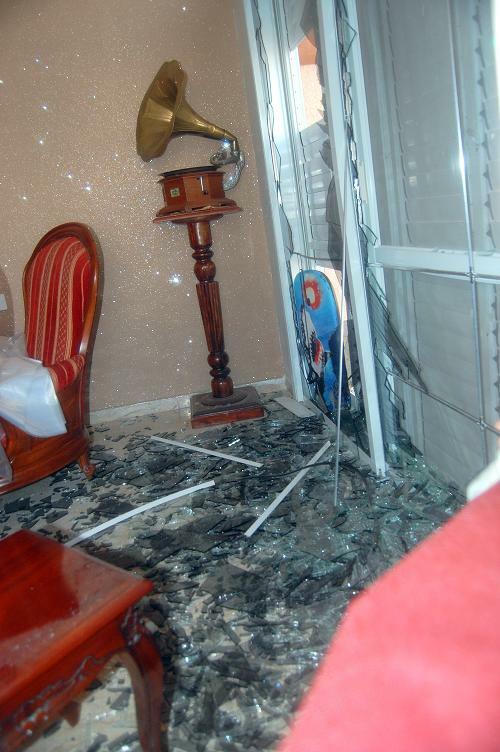 Be'er Sheba resident Chen Saban, a Sapir College student in her early twenties whose house was hit, described how she and her family were lucky enough to reach the secured room on time, saying she never expected her home to be hit. She said it was ironic because she goes to Sapir College, which is only a few km away from Gaza. Chen, who is supposed to get married in the next 3 weeks, is no longer certain about her future in Be'er Sheba and how she ill be able to plan her life living there. It was amazing to hear all this because it took me 45 minutes to drive from Sderot to Be'er Sheba, which is 40km from Gaza, with residents having 60 seconds to run for the shelter once the siren goes off. And still the same reaction and comments of the frightened and traumatized people. Today, the more than 1 million Israelis who live in the range of 40km from Gaza are not feeling as secure as they did yesterday, asking themselves "who is next?" the experience of 'cast lead'' that this would happen, they have (missiles) and hiding them, to launch and fire them at the right time, on any target in Be'er Sheba. It's a matter of time. They've learned our capabilities and they've learned us". Since the last "cease fire" 530 rockets and missiles have been fired towards the South Western, past of Israel. The Iranian Grad missile exploding in Bair-Sheba is a reminder how that a few months ago the Shin-Bet reported that there's a stack of over 5,000 Iranian missiles in Gaza, all of them having a range of 40 KM. This is especially troubling because, in November 2009, Hamas test-fired a missile test towards the Mediterranean, reaching 60 KM, which is the distance from Northern Gaza to Tel-Aviv. In November 2010, the ITIC reported that Hamas has missiles with an 80km range. Almost everyone in the Western Negev knows not it's not "if'" but "when"' the next missile escalation starts, leading to the next Gaza war. After living in Sderot for the past 5 years, watching the construction of 5,000 new bomb shelters, you don’t have to be a prophet to understand that the highest authorities in Israel know there has not been a permanent end to the rocket fire. Being realistic, Israel has to be prepared for many more years of conflict on the Gaza border. While Iran is certainly a threat for Israel, the biggest delegitimization threat for Israel, is with no doubt Gaza. Add to this the uprisings in Egypt and North Africa, bringing to power groups that have already declared they will end the "peace treaty" with Israel. The harsh response that Israel received from the world media and many governments during and after Cast Lead, after the Flotilla incident, and right up to today is actually a modern-day version of a very old demonization of Jews and Israel. A tremendous effort is being made to delegitimize Israel, with the goal of eliminating the Jewish state. How Israel will deal with this threat? How should Israel deal with this threat? Brig.-Gen. (res.) Amatzia Chen believes that the current policy has failed. "In all of the previous wars, starting from the 1956 Suez Operation, through the Six Day War and in the Yom Kippur War as well, the IDF took the fight into enemy territory," Chen recalled. "The security concept was that of fighting the war we choose, and seizing the initiative. But since 1982, after that rally in Rabin Square, Rabin and Peres decided, for political reasons, that the strategy needs to be changed and that we should only go to war when there is no choice - i.e., when the sword is on our neck." Chen said that since that decision was made, Israel has lost its deterrent capability. "Our enemies understood the dramatic change in Israel's security concept as a position of weakness. In any case, they had ceased threatening us with regular armies and turned instead to the weapon of terror. They murdered hundreds of Jews inside Israel, but controlled the bloodletting so as to enable Israel's leaders to maintain the concept that one does not go to war as long as there is a choice." "Every Israeli citizen knows that the Israel of today is not the Israel of pre-1982." 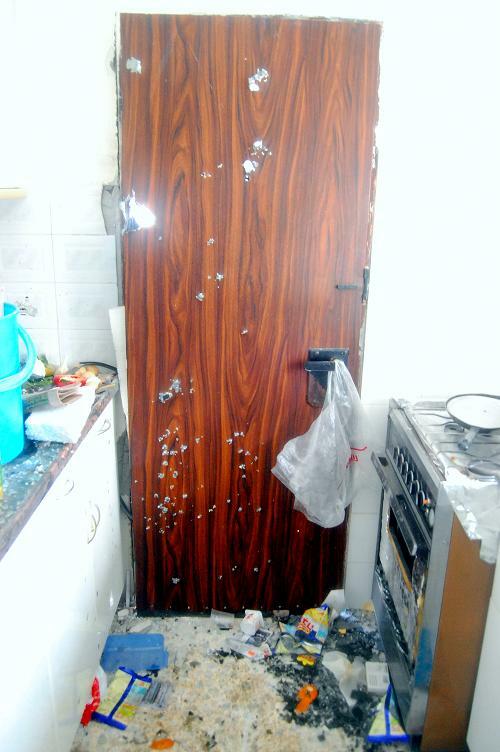 Chen said that artillery fire on Gaza is not a proper response to the missile attack on Be'er Sheva. "We are a nation that wants to live, and there is no point in fair play when it comes to terrorists. That is not how terror is defeated. 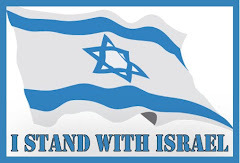 The State of Israel is a sovereign state that needs to formulate a proper strategy. Unfortunately, the strategy today is that if you are fired upon you fire back. 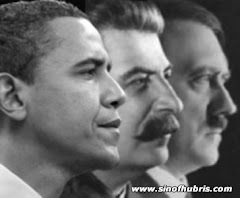 We are, in effect, signaling to the enemies that they can continue using the same method in the future, too." There is great anger in Sderot, a city with more bomb shelters than playgrounds. Like everyone else on the planet, I have heard about the "complicated" situation in the Middle East my whole life: promises to fix it, hopeful negotiations that crumble behind closed doors, rockets, wars, treaties, stalemates, etc. Round and round it goes until, exasperated, I figure both sides are unwilling to reach the type of tough-but-straightforward agreements that brought peace to Ireland and South Africa, and I give up. "It's complicated" is a Facebook status, not a diplomatic agreement. I spent the last two weeks in Israel. The trip was free, as it is to any Jew, through a program called "Taglit Birthright." To any students who come from a Jewish background, I suggest checking it out. It is a free trip to Israel, if nothing else. Last Wednesday I visited Sderot, a town of about 20,000 people in the western Negev desert, less than a mile away from the Gaza strip. Sderot has been the target of more than 10,000 rockets fired from Gaza since 2000. Gaza is controlled by the militant Islamic group Hamas. Sderot is the only town in the 21st Century where rockets are being continually fired at a civilian population. To deal with the rocket attacks, the town has a siren that gives residents a 15-second warning to get into a bomb shelter. Stop for a moment and consider how far you could get in 15 seconds. Could you get to the nearest bathroom? The nearest car? The nearest stairway? Sderot is the bomb shelter capitol of the world. Every house has a bomb shelter. Apartment buildings have bomb shelters crawling up their sides. Every bus stop is a bomb shelter and others are spaced in between; there is a bomb shelter about 15 seconds away from most places. If you are a child in Sderot, you should hope you are in school when the rockets come. Older schools have been retrofitted with huge steel shields on their outer walls and roofs. Newer schools are literally giant bomb shelters, their paltry playgrounds nothing but dust and three safe cubes awaiting the siren's call. Other parts of town have the type of playgrounds we grew up on: ladder up, slide down, monkey bars and the wall with a clear bubble that never made sense. They have painted a castle a nice shade of purple, and made two long concrete snakes look so vibrant and fun, you could almost forget they, too, are bomb shelters. Between 70 to 95 percent of children in Sderot have Post-Traumatic Stress Disorder, according to Haaretz, an Israeli newspaper. So why are people still living in this god-forsaken place? There are a few reasons. For one, housing is much cheaper there (feel free to guess why). For another, Sderot has one of the most lively and productive music scenes in the Eastern Hemisphere. The town is home to more chart-topping bands than any other in Israel and rivals any in Europe. But the real reason people stay is because they feel they must. Sderot is internationally recognized as part of Israel. If they leave, if they give up, what happens to the next town? And the next? Rockets from Gaza can hit Israel's economic and cultural centers - Tel Aviv and Jerusalem, respectively. I saw all this from Israel's side of the border, so I cannot speak with objective moral authority on who is right or wrong, victim or oppressor. I know everyone I talked to in Israel wants peace more than anything, and would give up land if they thought it would achieve it. I also know that people suffer in Gaza and struggle for a homeland in the West Bank. As a commentator, I am supposed to speak in shoulds and should nots. No one should have to live like the people of Sderot. That's all I've got. I always allow the people of Sderot to speak for themselves. This is their story, their struggle, their battle. What is happening in Sderot, Beer-Sheva, Ashkelon, the Negev, is the price for living in Israel. For Sderot's residents it is the price of living on the frontier. If they surrender their city, it will only encourage Hamas to conquer the next city, then the one after it. Until they have conquered the whole nation. You are not on the frontier, the front line in this battle, but you can help. The small donation that you give to the Sderot Media Center goes to help the people, especially the children of Sderot. Just a bit of your spare change will help. To donate click here. I've said it before when it comes to all of these uprisings and revolutions in the Muslim countries in the Middle East and northern Africa - there really is no upside to all of it. Let's face it, there is no American Founding Father type ready to take over these countries ...in most cases, if the current government is disposed, the alternatives are either bad or worse. 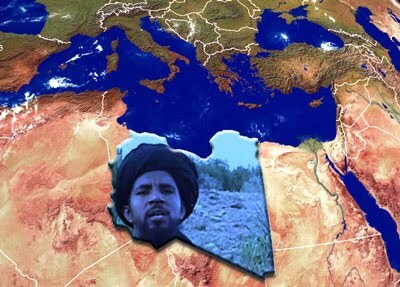 The same can be viewed in Libya. Of course Moammar Gaddafi is a mad man. But waiting in the wings in Libya is an old foe of Gaddafi's - a group with distinct links to al Qaeda and as this article at Family Security Matters outlines, a bunch of members of the Libyan Islamic Fighting Group have been freed from Libyan prisons and this group probably resembles al Shabaab in Somalia more than it resembles the Whig party in revolutionary America. The mounting violence in Libya could have the unintended consequence of reviving radical Islamists including the Libyan Islamic Fighting Group (LIFG), a terror organization aligned with al-Qaida. As Muammar Gaddafi's 41-year-old dictatorship totters on the brink, U.S. policymakers should pay close attention to reports that LIFG members are being released from Libyan jails, according to Jonathan Schanzer, a former Treasury Department official who monitors jihadist organizations. Until now, the LIFG has been essentially moribund inside Libya since Gaddafi's regime launched a repression campaign against it in the late 1990s. But last week, more than 100 members of the LIFG were reportedly set free under mysterious circumstances from a jail near Tripoli. It is unclear whether they were released by anti-government forces or by order of Gaddafi, whose government says it has freed close to 850 purportedly reformed jihadists from prison in recent years. Whatever the reason, news that LIFG members are getting out of jail is very troubling, according to Jonathan Schanzer, currently vice president of the Foundation for the Defense of Democracies. "Either way, what we're risking is a resuscitation of the LIFG," he said. The LIFG was formed by Libyans who went to join the Afghan mujahedeen in fighting the Soviet Union during the 1980s. The organization's goal was replacing Gaddafi's government "with a hard-line Islamic state," said Noman Benotman, a former member of the LIFG's Shura Committee. In the mid-1990s, he said, the group spent years planning an operation to overthrow Gaddafi. That effort failed, as did several attempts to assassinate the Libyan dictator in the 1990s. You know, whenever you see an organization's goal is to establish "a hard-line Islamic state" you best be ready to either confront that or run for the hills. And this is what is at risk in all of these countries going through these upheavals. We literally could see hard-line islamic states in Tunisia, Libya, Egypt and Jordan - I mean, can you imagine the consequences of that? I'm not saying I'm some kind of closet fan of Moammar Gaddafi - I celebrated the night that Ronald Reagan's orders brought death and destruction to his family. I'm simply saying that the United States is going to be faced with more terrorism risks under an islamic regime there than with the insane one in charge. Sometimes, you have to come to the conclusion that a neighbor of yours that consistently plays irritating loud music is better than a new one that will shoot your family pet. Since late 2003, when Gaddafi agreed to relinquish his weapons of mass destruction, the Libyan regime has sought to re-brand itself as an ally of the West in fighting al-Qaida and has provided intelligence on the LIFG. As his domestic situation deteriorates, Gaddafi may believe it is in his interest to release terrorists "in order to say to the West, 'you need to back us'" and to drive home the point that the war against al Qaida will suffer if he is driven from power, Schanzer told the Investigative Project on Terrorism. Monitoring LIFG's situation should be a top priority of U.S. intelligence agencies as they watch events in Libya, he said, and congressional committees would do well to examine the issue in oversight hearings. Italian Foreign Minister Francesco Franco Frattini also mentioned reports that an emirate had been declared in that region of Libya. He said it would be "worrying" if "radical Islam is only a few hundred kilometers away from the European Union's front door." Between 1997 and 2001, LIFJ and al-Qaida increasingly coordinated their operations and the LIFJ established two military training camps in Afghanistan. After 9/11, LIFG joined al-Qaida in attacking U.S.-led Coalition troops who were fighting to liberate Afghanistan from the Taliban. In 2002, senior al-Qaida operative Abu Zubaydah was captured in Pakistan alongside at least three LIFG operatives. In December 2004, the State Department designated the LIFG a Foreign Terrorist Organization: "LIFG members have been directly or indirectly implicated in a number of terrorist activities, particularly in North Africa…The LIFG constitutes the most serious threat to U.S. interests and personnel in North Africa." According to the State Department, senior LIFG leaders based in Europe helped plan a wave of suicide attacks in May 2003 targeting Western and "Jewish" interests in Casablanca, Morocco, including a restaurant, a hotel and community centers. More than 40 people were killed and more than 100 injured in the attacks. In 2004, CIA Director George Tenet said in Senate testimony that one of the "most immediate threats" comes from "smaller international Sunni extremist groups who have benefited from al Qa'ida links," such as the LIFG. In February 2006, the Treasury Department announced it was formally designating four organizations and five individuals as financial supporters of the LIFG, "an al Qaida affiliate known for engaging in terrorist activity in Libya and cooperating with al Qaida worldwide." Patrick O'Brien, assistant Treasury secretary for terrorist financing and financial crime, said the LIFG "threatens global safety and stability through the use of violence and its ideological alliance with al Qaida." Within the next few years, however, the Gaddafi regime (which has provided the United States with intelligence on LIFG) embarked on a campaign to persuade LIFG members to abandon jihad. It was spearheaded by the Libyan ruler's Western-educated son, Saif al-Islam Gaddafi, who began a dialogue with LIFG members. In 2009 and 2010, the Gaddafi Foundation (an organization headed by the younger Gaddafi) brought foreign journalists to Libya to showcase its campaign to persuade jihadists to change their ways. During one visit last year, the foundation arranged for the journalists to interview 88 low- and mid-level members of the LIFG. They had won their release after signing a document criticizing al-Qaida and denouncing attacks against non-combatants. The outreach efforts won the Gaddafi regime generally favorable coverage from the Los Angeles Times. "A nation the West once considered a major sponsor of terrorism may have pulled off a groundbreaking coup against Al Qaeda: coaxing a group once strongly allied with Osama bin Laden to renounce its one time partner as un-Islamic," read the Times' December 2009 account. "The defanging of a group that the U.S. has listed as a terrorist organization since 2004 is the fruit of a years-long dialogue between the militants and the government." Schanzer expressed skepticism about the Gaddafi Foundation's claims of success persuading jihadists to abandon violence. "I'd like to see the recidivism rates," he said, referring to statistics that could shed light on the percentage that have returned to the battlefield. Schanzer said advocates had yet to provide any data on the subject. "To what extent can you trust Gaddafi's judgment on who they let out?" he added. "Do they go back to join the global jihad?" Based on the available information, "it is impossible to tell." Reports that Libyan jihadists are being freed from jail are an ominous indication of where the country is headed, Schanzer said. In interviews with the Washington Postlast year, some participants in the Libyan rehabilitation program showed why a healthy skepticism is in order. Sami al-Saadi, a founder of the LIFG and a former aide to Osama bin Laden released from a Libyan prison two months earlier, expressed doubt the al Qaida boss "is calling for the killing of any single civilian." Others said they still believed in waging war against American soldiers in Iraq and Afghanistan. They also said the conflicts in Somalia and the Palestinian territories were legitimate forms of jihad. "When America invades a country, the insurgency is legal and lawful. From a religious point of view, it is permissible and we have to support it," said one of the men, the group's emir. "And U.S. policies in Israel and other places adds (sic) fuel to the fire." The Libyans brought in a mediator (described by the Post as a "moderate Islamist") to engage with the ex-militants. He agreed with the former jihadists. 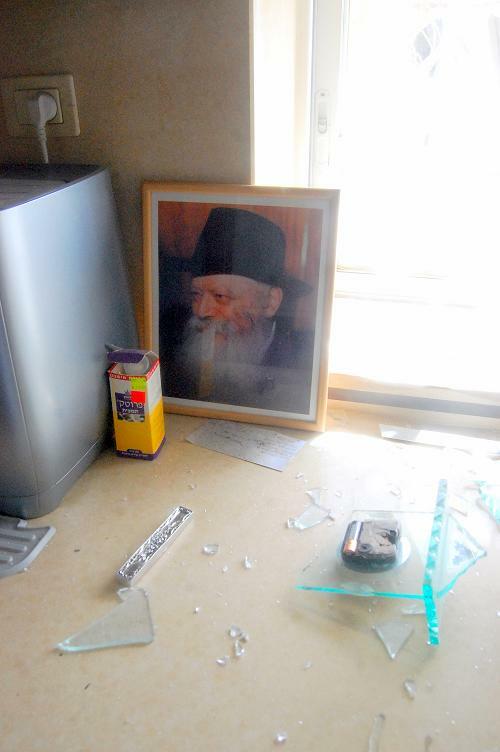 "Violence against occupation is a sacred act," he said. "It is a sacred jihad." "I don't know how you parse jihad," U.S. Ambassador to Libya Gene Cretz told the Post when asked about these comments. "If it means that, 'If you don't do it in Libya, you are free to go and do it elsewhere,' that would be a little troubling to us." The Datta Khel area of North Waziristan is one of the favorite targets of U.S. predator drones and that played out once again this morning as our drones hit both a Taliban compound and a vehicle and the end result was six dead Taliban jihadis. Unmanned US Predators struck yet again in Pakistan's lawless tribal agencies today, again in the Taliban-controlled tribal agency of North Waziristan. Six "militants" were reported killed in the third strike in five days. The recent strikes mark an end to a pause in the Predator program that sparked much speculation as to the causes. The latest strike took place in the Datta Khel area of North Waziristan. Unmanned US Predators, or the more deadly Reapers, fired several missiles at a compound and a car in the area, according to Dawn and The Associated Press. At this time, no senior Taliban or al Qaeda fighters have been reported killed in the attack. Perhaps we will start to see our predator drone strikes get back on schedule now with the majority of the strikes in the past coming on the days of Friday, Saturday and Sunday - I've never been able to figure just why that is but I'm sure the statistics would bear out that at least 70% of all dead Taliban in these strikes are taken on the weekend. The target of the strike is also not known, but the Datta Khel area is known to host a plethora of al Qaeda and allied jihadist and Taliban groups. The Datta Khel area is administered by the Taliban commander for North Waziristan, Hafiz Gul Bahadar. He provides shelter to top al Qaeda leaders as well as terrorists from numerous Pakistani and Central Asian terror groups. Datta Khel is a known hub of Taliban, Haqqani Network, and al Qaeda activity. While Bahadar administers the region, the Haqqani Network, al Qaeda, and allied Central Asian jihadi groups are also based in the area. The Lashkar al Zil, or al Qaeda's Shadow Army, is known to have a command center in Datta Khel. Datta Khel serves as a command and control center for al Qaeda's top leaders. Some of al Qaeda's top leaders have been targeted and killed in Datta Khel. A strike on Dec. 17, 2009, targeted Sheikh Saeed al Saudi, Osama bin Laden's brother-in-law and a member of al Qaeda's Shura Majlis, or executive council. Al Saudi is thought to have survived the strike, but Abdullah Said al Libi, the commander of the Shadow Army or Lashkar al Zil, and Zuhaib al Zahibi, a general in the Shadow Army, were both killed in the attack. But the most significant attack in Datta Khel took place on May 21, 2010; it resulted in the death of Mustafa Abu Yazid, a longtime al Qaeda leader and close confidant of Osama bin Laden and Ayman al Zawahiri. Yazid served as the leader of al Qaeda in Afghanistan and the wider Khorasan, a region that encompasses portions of Pakistan, Iran, and several Central Asian states. More importantly, Yazid was as al Qaeda's top financier, which put him in charge of the terror group's purse strings. He served on al Qaeda's Shura Majlis, or top decision-making council. Yazid also was closely allied with the Taliban and advocated the program of embedding small al Qaeda teams with Taliban forces in Afghanistan. Today's strike is the third in five days. A strike on Feb. 20 in South Waziristan was the first in Pakistan since Jan. 23, when the Predators pounded three different targets in North Waziristan. Many analysts speculated that the pause in strikes was related to the shooting deaths of two Pakistanis by a US consular official in Lahore on Jan. 27. Pakistan has refused to release the American. But a look at the Predator strike history shows that there have been several long pauses in time between the strikes. The most recent gap was not the longest since the US ramped up the program in August 2008 [see LWJ report, Analysis: Gap in Pakistan Predator strikes not unusual]. January 2011 proved to be the slowest month for Predator strikes in a year, with nine, and February is on track to be slower than January. The recent slowdown in attacks has occurred after the pace of the strikes from the beginning of September 2010 until the end of December picked up. September's record number of 21 strikes was followed by 16 strikes in October, 14 in November, and 12 in December. The previous monthly high was 11 strikes in January 2010, after the Taliban and al Qaeda executed a successful suicide attack at Combat Outpost Chapman that targeted CIA personnel who were active in gathering intelligence for the Predator campaign in Pakistan. The suicide bombing at COP Chapman killed seven CIA officials and a Jordanian intelligence officer. 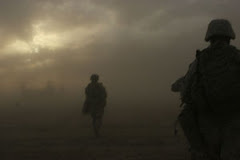 In 2010 the strikes were concentrated almost exclusively in North Waziristan, where the Afghan and Pakistani Taliban, the Haqqani Network, al Qaeda, and a host of Pakistani and Central and South Asian terror groups are based. All but 13 of the 117 strikes took place North Waziristan. Of the 13 strikes occurring outside of North Waziristan, seven were executed in South Waziristan, five were in Khyber, and one was in Kurram. That trend is holding true this year, with all seven strikes in 2011 taking place in North Waziristan. Since Sept. 1, 2010, the US has conducted 75 strikes in Pakistan's tribal agencies. The bulk of those attacks have aimed at the terror groups in North Waziristan, with 67 strikes in the tribal agency. Many of the strikes have targeted cells run by the Islamic Jihad Group, which have been plotting to conduct Mumbai-styled terror assaults in Europe. A Sept. 8 strike killed an IJU commander known as Qureshi, who specialized in training Germans to conduct attacks in their home country. Video: Russians Do It Better? Are We Going To Win This War Against Radical Islam? As most regular readers here know, I have, for a long time, tried to portray America's war against radical islam as unprepared, unrealistic and apologetic. Well, this article from Family Security Matters seems to agree with me for the most part as it asks the question, "Are we going to win this war?" What I have tried to point out is that not only do we in America lack the will to confront the jihadis on the battle field completely and ruthlessly but we have allowed ourselves to be sitting ducks back home here to the wave of sharia law and islamophobia claims. Yes, we are at war - both in direct battle of weaponry and against the soft jihad inside of our culture. I find it amazing that in the past few weeks we've heard all of these terrible things about the Muslim Brotherhood in Egypt while many of us have been sounding the alarm for years that the Muslim Brotherhood is inside of America...has been for over a decade...and they have established a network across our very own land. So, if you ask me if we are going to win this war....well, if we do what we've been doing, no way. But that's no reason to give up - with the right leader, with a new wave of educated Americans on the subject, this enemy can be turned away and crushed. That I firmly believe. Are We Going To Win This War? We’re at war. Our enemy is radical Islam. It's the aggressor and its goal is to put the world under Sharia Law. Its biggest obstacle is the United States of America because we are the epitome of Western Civilization. Our goal is to defeat radical Islam. That critical question was asked by someone from the audience at a panel discussion called “The Sharia Challenge in the West,” I attended two weeks ago at the three-day CPAC 2011 (Conservative Political Action Conference). The panel of experts included former CIA Director James Woolsey; former US Attorney Andrew McCarthy who successfully prosecuted the first World Trade Center bombers in 1993; Clifford May - president of the Foundation For the Defense of Democracies; and Ayaan Hirsi Ali - one of the most courageous people alive. None of the panelists answered with an emphatic “Yes” and that depressed me, even if it didn’t surprise me. Each indicated we could win, but whether we will or not depends on how much Americans want to win. That, unfortunately, is still an open question. Panelist Ayaan Hirsi Ali has the most to lose if we don’t win because she’s already marked for death by our enemy. She wrote the script for “Submission,” a movie directed by Theo Van Gogh, a Dutch filmmaker and grand-nephew of the famous Dutch painter. “Submission” criticized Islam for sanctioning abuse of women. Both Hirsi Ali and Van Gogh were threatened with death if they released it, but they did so anyway. 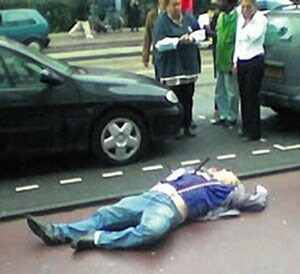 Shortly after, in broad daylight on the streets of Amsterdam, a Muslim immigrant shot Van Gogh eight times, cut his throat, and pinned a note to his torso with a dagger, saying Hirsi Ali was next. Ever since, she’s been under armed guard 24-7-365. Even though she was an elected member of Dutch Parliament, her government has balked about paying to defend her. She moved to the United States and accepted a fellowship with the American Enterprise Institute. Her security is now paid for privately. The question lingered in the air. Hirsi Ali said the way to win is to “offer an alternative vision,” and I couldn’t agree more strongly. Western Civilization is itself an alternative vision, but our universities and our media are dominated by liberals who blame it for the world’s ills. American colleges and universities are eliminating western civilization courses. And, The Muslim Brotherhood’s goal is to “bring down western civilization from within,” (If you hit this link, scroll down for the English translation). The American left (including many in the Obama Administration) supports the Muslim Brotherhood and its offspring, Hamas. Ramsay Clark, Bill Ayers, Code Pink, and A.N.S.W.E.R. tried to bring aid to Hamas by breaking the Israeli blockade of Gaza last year. The American Left abhors Western Civilization and cooperates with the Muslim Brotherhood to bring it down. “The way you fight this thing is to expose it,” said panelist Andrew McCarthy. Trouble is, leftists dominating our universities shout down speakers who try to expose it. Sharia is Islamic law. Under it, women cannot go out in public unless accompanied by a male relative. Thieves get their hands cut off. Adulterers and homosexuals are stoned to death. If you reject Islam, you’re killed. A woman’s testimony in legal issues is worth half that of a man. Quran [Sharia] is our law. Jihad [holy war] is our way. She’s right of course. We need a massive propaganda campaign to expose Sharia Law and the theist totalitarianism of radical Islam for the dark-age depravity it is. We must contrast our enemy’s vision with the values of our constitutional democracy embodied in The Declaration of Independence and the Constitution with its Bill of Rights. Right again. As our leftist media and our leftist universities continue their indoctrination, fewer and fewer Americans understand that our republic is the summit of civilization. Many won’t ever realize that unless we lose it. Then they’ll find out the hard way, but the rest of us need to witness confidently while there’s still time. We need a president who will celebrate Western Civilization, not apologize for it, who will call our enemy by its names: Radical Islam, Sharia, and jihad. We need a president who will champion American exceptionalism, who will foster patriotism in every American and proclaim the United States as the greatest country in the history of the world - because it is. Please ponder this: How can we expect to defeat our enemy if we’re unwilling even to offend him?